Mirtazapine (brand names: Avanza, Axit, Mirtaz, Mirtazon, Remeron, Zispin) is a United States in 1996, and is used primarily in the treatment of depression. It is also commonly used as an anxiolytic, hypnotic, antiemetic and appetite stimulant. In structure, mirtazapine can also be classified as a tetracyclic antidepressant (TeCA) and is the 6-aza analogue of mianserin. It is also racemic—occurs as a combination of both (R)- and (S)-stereoisomers, both of which are active. Its patent expired in 2004, so generic versions are available. Mirtazapine's primary use is the treatment of major depressive disorder and other mood disorders. A case report has been published in which mirtazapine reduced visual hallucinations in a patient with Parkinson's disease psychosis (PDP). This is in alignment with recent findings that inverse agonists at the 5-HT2A receptors are efficacious in attenuating the symptoms of Parkinson's disease psychosis. As is supported by the common practice of prescribing low-dose quetiapine and clozapine for PDP—doses too low to antagonise the D2 receptor, but sufficiently high doses to inversely agonise the 5-HT2A receptors. Mirtazapine is sometimes prescribed as an appetite stimulant for cats or dogs experiencing anorexia due to medical conditions such as chronic kidney disease. It is especially useful for treating combined poor appetite and nausea in cats and dogs. In clinical studies, mirtazapine has been found to be an effective antidepressant with a generally tolerable side-effect profile relative to other antidepressants. In a major meta-analysis published in 2009 that compared the efficacy and tolerability of 12 second-generation antidepressants, mirtazapine was found to be superior to all of the included selective serotonin reuptake inhibitors (SSRIs), serotonin-norepinephrine reuptake inhibitors (SNRIs), reboxetine and bupropion in terms of antidepressant efficacy, while it was average in regard to tolerability. However, its superior efficacy over the other medications in the top four (escitalopram, sertraline and venlafaxine) did not reach statistical significance. Compared to earlier antidepressants, mirtazapine has been found to be significantly superior to trazodone, while it has been shown to be approximately equivalent in efficacy to several of the tricyclic antidepressants including amitriptyline, doxepin and clomipramine, though with a much improved tolerability profile. However, two other studies found mirtazapine to be significantly inferior to imipramine, another TCA. One study compared the combination of venlafaxine and mirtazapine to the monoamine oxidase inhibitor (MAOI) tranylcypromine alone and found them to be similarly effective, though tranylcypromine was much less tolerable in regard to side effects and drug interactions. Mirtazapine is not considered to have a risk of many of the side effects often associated with other antidepressants like the SSRIs, and may actually improve certain ones when taken in conjunction with them. These adverse effects include decreased appetite, weight loss, insomnia, nausea and vomiting, diarrhoea, urinary retention, increased body temperature, excessive sweating, pupil dilation and sexual dysfunction. In general, some antidepressants, especially SSRIs, can paradoxically exacerbate some peoples' depression or anxiety or cause suicidal ideation. Despite its sedating action, mirtazapine is also believed to be capable of this, so in the United States and certain other countries, it carries a black box label warning of these potential effects. Mirtazapine and other antidepressants may cause a withdrawal syndrome upon discontinuation. A gradual and slow reduction in dose is recommended to minimize withdrawal symptoms. Effects of sudden cessation of treatment with mirtazapine may include depression, anxiety, panic attacks, vertigo, restlessness, irritability, decreased appetite, insomnia, diarrhoea, nausea, vomiting, flu-like symptoms such as allergies and pruritus, headaches and sometimes hypomania or mania. Mirtazapine is considered to be relatively safe in the event of an overdose, although it is considered slightly more toxic in overdose than most of the SSRIs (except citalopram). Unlike the TCAs, mirtazapine showed no significant cardiovascular adverse effects at 7 to 22 times the maximum recommended dose. Case reports of overdose with as much as 30 to 50 times the standard dose described the drug as relatively nontoxic, compared to TCAs. Twelve reported fatalities have been attributed to mirtazapine overdose. The fatal toxicity index (deaths per million prescriptions) for mirtazapine is 3.1 (95% CI: 0.1 to 17.2). This is similar to that observed with SSRIs. 5-HT2A receptor 69 The (S)-(+) enantiomer is responsible for this antagonism. 5-HT2C receptor 39 Inverse agonist The (S)-(+) enantiomer is responsible for this action. 5-HT3 receptor ? Similar to 5-HT2A/5-HT2C (mouse neuroblastoma cell) R-(–) enantiomer antagonises the 5-HT3 receptor. α2A-adrenergic receptor 20 The S-(+) enantiomer is responsible for this antagonism at autoreceptors. Heteroreceptors are blocked by both the (S)-(+) and (R)-(–) enantiomers. α2C-adrenergic receptor 18 The S-(+) enantiomer is responsible for this antagonism at autoreceptors. Heteroreceptors are blocked by both the (S)-(+) and (R)-(–) enantiomers. All affinities listed were assayed using human materials except those for α1-adrenergic and mACh that are for rat tissues, due to human values being unavailable. Mirtazapine has recently been found to act as a weak (EC50 7.2 μM) κ-opioid receptor partial agonist. Antagonization of the α2-adrenergic receptors, which function largely as autoreceptors and heteroreceptors enhances adrenergic and serotonergic neurotransmission, the notable ones being central 5-HT1A receptor-mediated transmission in the dorsal raphe nucleus and hippocampus; hence, mirtazapine's classification as a NaSSA. Indirect α1-adrenoceptor-mediated enhancement of 5-HT cell firing and direct blockade of inhibitory α2-heteroreceptors located on 5-HT terminals are held responsible for the increase in extracellular 5-HT. Because of this, mirtazapine has been said to be a functional "indirect agonist" of the 5-HT1A receptor. Increased activation of the central 5-HT1A receptor is thought to be a major mediator of efficacy of most antidepressant drugs. Unlike most conventional antidepressants, however, at clinically used doses mirtazapine has no appreciable affinity for the serotonin, norepinephrine, or dopamine transporters and thus lacks any significant effects as a reuptake inhibitor of these neurotransmitters, nor does it have any significant inhibitory effects on monoamine oxidase. Antagonism of the 5-HT2 subfamily of receptors and inverse agonism of the 5-HT2C receptor appears to be in part responsible for mirtazapine's efficacy in the treatment of depressive states. The 5-HT2C receptor is known to inhibit the release of the neurotransmitters dopamine and norepinephrine in various parts of the brains of rodents, notably in reward pathways such as the ventral tegmental area. Accordingly, it was shown that by blocking the α2-adrenergic receptors and 5-HT2C receptors mirtazapine disinhibited dopamine and norepinephrine activity in these areas in rats. In addition, mirtazapine's antagonism of 5-HT2A receptors has beneficial effects on anxiety, sleep and appetite, as well as sexual function regarding the latter receptor. The newest research however has shown that mirtazapine is actually an inverse agonist of the 5-HT2C receptor. 5-HT2C inverse agonists have been shown to inhibit mesoaccumbens dopamine outflow attenuating the rewarding properties of various substances like morphine. This inhibition of dopamine may be stronger than thought as substances with 5-HT2C inverse agonist properties may have more activity to regulate dopamine neurotransmission than ones with competitive antagonism. With its newly understood properties of 5-HT2C inverse agonism, it is being investigated and shown to lower drug seeking behaviour, conditioned place preference and the rewarding effects of substances such as methamphetamine in various human and animal studies. It is also being investigated to help in substance abuse disorders with withdrawal effects and remission rates. but some studies have shown mixed benefit. Stimmel, GL; Dopheide, JA; Stahl, SM (1997). "Mirtazapine: an antidepressant with noradrenergic and specific serotonergic effects". Pharmacotherapy 17 (1): 10–21. Anttila, SA; Leinonen, EV (2001). "A review of the pharmacological and clinical profile of mirtazapine". CNS Drug Rev 7 (3): 249–64. ^ a b c d e f g h i j Timmer, CJ; Sitsen, JM; Delbressine, LP (June 2000). "Clinical pharmacokinetics of mirtazapine". Clinical Pharmacokinetics 38 (6): 461–74. ^ a b c d e f g "REMERON (mirtazapine) tablet, film coated [Organon Pharmaceuticals USA]". DailyMed. Organon Pharmaceuticals USA. October 2012. Retrieved 24 October 2013. ^ a b c d e f g h "Axit Mirtazapine PRODUCT INFORMATION". TGA eBusiness Services. alphapharm. 25 October 2011. Retrieved 15 October 2013. ^ a b c d e f "Mirtazapine 30 mg Tablets - Summary of Product Characteristics" (PDF). electronic Medicines Compendium. Sandoz Limited. 20 March 2013. Retrieved 24 October 2013. ^ a b c d e f g h i j Anttila, SA; Leinonen, EV (2001). "A review of the pharmacological and clinical profile of mirtazapine". CNS Drug Reviews 7 (3): 249–64. ^ a b c d e f g h Brayfield, A, ed. (30 January 2013). Mirtazapine. Martindale: The Complete Drug Reference (The Royal Pharmaceutical Society of Great Britain). Retrieved 3 November 2013. ^ Schatzberg, AF; Cole, JO; DeBattista, C. "3". Manual of Clinical Psychopharmacology (7th ed.). Arlington, VA: American Psychiatric Publishing. ^ a b Gorman, JM (1999). "Mirtazapine: clinical overview". J Clin Psychiatry. 60 Suppl 17: 9–13; discussion 46–8. ^ Benjamin, S; Doraiswamy, PM (July 2011). "Review of the use of mirtazapine in the treatment of depression". Expert Opinion on Pharmacotherapy 12 (10): 1623–32. ^ Goodnick, PJ; Puig, A; DeVane, CL; Freund, BV (July 1999). "Mirtazapine in major depression with comorbid generalized anxiety disorder". J Clin Psychiatry 60 (7): 446–8. ^ a b c d Croom, KF; Perry, CM; Plosker, GL (2009). "Mirtazapine: a review of its use in major depression and other psychiatric disorders". CNS Drugs 23 (5): 427–52. ^ Muehlbacher, M; Nickel, MK; Nickel, C; et al. (December 2005). "Mirtazapine treatment of social phobia in women: a randomized, double-blind, placebo-controlled study". Journal of Clinical Psychopharmacology 25 (6): 580–3. ^ Koran, LM; Quirk, T; Lorberbaum, JP; Elliott, M (October 2001). "Mirtazapine treatment of obsessive-compulsive disorder". J Clin Psychopharmacol 21 (5): 537–9. ^ Carpenter, LL; Leon, Z; Yasmin, S; Price, LH (June 1999). "Clinical experience with mirtazapine in the treatment of panic disorder". Ann Clin Psychiatry 11 (2): 81–6. ^ Carli, V; Sarchiapone, M; Camardese, G; Romano, L; DeRisio, S (July 2002). "Mirtazapine in the treatment of panic disorder". Arch. Gen. Psychiatry 59 (7): 661–2. ^ Landowski, J (2002). 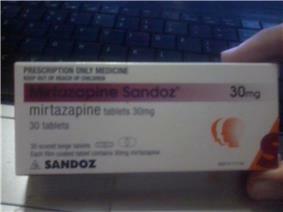 "[Mirtazapine--an antidepressant]". Psychiatria Polska (in Polish) 36 (6 Suppl): 125–30. ^ Chinuck, RS; Fortnum, H; Baldwin, DR (December 2007). "Appetite stimulants in cystic fibrosis: a systematic review". Journal of Human Nutrition and Dietetics : the Official Journal of the British Dietetic Association 20 (6): 526–37. ^ Davis, MP; Khawam, E; Pozuelo, L; Lagman, R (August 2002). "Management of symptoms associated with advanced cancer: olanzapine and mirtazapine. A World Health Organization project". Expert Review of Anticancer Therapy 2 (4): 365–76. ^ Hartmann, PM (January 1999). "Mirtazapine: a newer antidepressant". Am Fam Physician 59 (1): 159–61. ^ Jindal, RD (2009). "Insomnia in patients with depression: some pathophysiological and treatment considerations". CNS Drugs 23 (4): 309–29. ^ Nutt, DJ (June 2002). "Tolerability and safety aspects of mirtazapine". Human Psychopharmacology. 17 Suppl 1: S37–41. ^ a b Li, TC; Shiah, IS; Sun, CJ; Tzang, RF; Huang, KC; Lee, WK (June 2011). "Mirtazapine relieves post-electroconvulsive therapy headaches and nausea: a case series and review of the literature". The Journal of ECT 27 (2): 165–7. ^ a b Kast, RE; Foley, KF (July 2007). "Cancer chemotherapy and cachexia: mirtazapine and olanzapine are 5-HT3 antagonists with good antinausea effects". Eur J Cancer Care (Engl) 16 (4): 351–4. ^ Twycross, R; Greaves, MW; Handwerker, H; et al. (January 2003). "Itch: scratching more than the surface". QJM : Monthly Journal of the Association of Physicians 96 (1): 7–26. ^ Greaves, MW (2005). "Itch in systemic disease: therapeutic options". Dermatologic Therapy 18 (4): 323–7. ^ Colombo, B; Annovazzi, PO; Comi, G (October 2004). "Therapy of primary headaches: the role of antidepressants". Neurological Sciences : Official Journal of the Italian Neurological Society and of the Italian Society of Clinical Neurophysiology. 25 Suppl 3: S171–5. ^ Tajti, J; Almási, J (June 2006). "[Effects of mirtazapine in patients with chronic tension-type headache. Literature review]". Neuropsychopharmacologia Hungarica : a Magyar Pszichofarmakológiai Egyesület Lapja = Official Journal of the Hungarian Association of Psychopharmacology (in Hungarian) 8 (2): 67–72. ^ Kohler, M; Bloch, KE; Stradling, JR (May 2009). "Pharmacological approaches to the treatment of obstructive sleep apnoea". Expert Opinion on Investigational Drugs 18 (5): 647–56. ^ Marshall, NS; Yee, BJ; Desai, AV; Buchanan, PR; Wong, KK; Crompton, R; Melehan, KL; Zack, N; Rao, SG; Gendreau, RM; Kranzler, J; Grunstein, RR (June 2008). "Two randomized placebo-controlled trials to evaluate the efficacy and tolerability of mirtazapine for the treatment of obstructive sleep apnea". Sleep 31 (6): 824–31. ^ Masi, G (2004). "Pharmacotherapy of pervasive developmental disorders in children and adolescents". CNS Drugs 18 (14): 1031–52. ^ Marek, GJ; Carpenter, LL; McDougle, CJ; Price, LH (February 2003). "Synergistic action of 5-HT2A antagonists and selective serotonin reuptake inhibitors in neuropsychiatric disorders". Neuropsychopharmacology : Official Publication of the American College of Neuropsychopharmacology 28 (2): 402–12. ^ Posey, DJ; Guenin, KD; Kohn, AE; Swiezy, NB; McDougle, CJ (2001). "A naturalistic open-label study of mirtazapine in autistic and other pervasive developmental disorders". J Child Adolesc Psychopharmacol 11 (3): 267–77. ^ Coskun, M; Karakoc, S; Kircelli, F; Mukaddes, NM (April 2009). "Effectiveness of mirtazapine in the treatment of inappropriate sexual behaviors in individuals with autistic disorder". J Child Adolesc Psychopharmacol 19 (2): 203–6. ^ Kumar, R; Sachdev, PS (May 2009). "Akathisia and second-generation antipsychotic drugs". Current Opinion in Psychiatry 22 (3): 293–99. ^ Hieber, R; Dellenbaugh, T; Nelson, LA (June 2008). "Role of mirtazapine in the treatment of antipsychotic-induced akathisia". Annals of Pharmacotherapy 42 (6): 841–6. ^ Graves, SM; Rafeyan, R; Watts, J; Napier, TC (December 2012). "Mirtazapine, and mirtazapine-like compounds as possible pharmacotherapy for substance abuse disorders: evidence from the bench and the bedside". Pharmacology & Therapeutics 136 (3): 343–353. ^ Vidal, C; Reese, C; Fischer, BA; Chiapelli, J; Himelhoch, S (March 2013). "Meta-Analysis of Efficacy of Mirtazapine as an Adjunctive Treatment of Negative Symptoms in Schizophrenia". Clinical Schizophrenia & Related Psychoses (Walsh Medical Media): 1–24. ^ Tagai, K; Nagata, T; Shinagawa, S; Tsuno, N; Ozone, M; Nakayama, K (June 2013). "Mirtazapine improves visual hallucinations in Parkinson's disease: a case report". Psychogeriatrics 13 (2): 103–107. ^ a b c Cipriani, A; Furukawa, TA; Salanti, G; Geddes, JR; Higgins, JP; Churchill, R; Watanabe, N; Nakagawa, A; Omori, IM; McGuire, H; Tansella, M; Barbui, C (February 2009). "Comparative efficacy and acceptability of 12 new-generation antidepressants: a multiple-treatments meta-analysis". Lancet 373 (9665): 746–58. ^ van Moffaert, M; de Wilde, J; Vereecken, A; Dierick, M; Evrard, JL; Wilmotte, J; Mendlewicz, J (March 1995). "Mirtazapine is more effective than trazodone: a double-blind controlled study in hospitalised patients with major depression". Int Clin Psychopharmacol 10 (1): 3–9. ^ a b c d e f g Fawcett, J; Barkin, RL (December 1998). "Review of the results from clinical studies on the efficacy, safety and tolerability of mirtazapine for the treatment of patients with major depression". J Affect Disord 51 (3): 267–85. ^ Bruijn, JA; Moleman, P; Mulder, PG; van den Broek, WW; van Hulst, AM; van der Mast, RC; van de Wetering, BJ (October 1996). "A double-blind, fixed blood-level study comparing mirtazapine with imipramine in depressed in-patients". Psychopharmacology (Berl.) 127 (3): 231–7. ^ Bruijn, JA; Moleman, P; Mulder, PG; van den Broek, WW (May 1999). "Depressed in-patients respond differently to imipramine and mirtazapine". Pharmacopsychiatry 32 (3): 87–92. ^ a b c McGrath, PJ; Stewart, JW; Fava, M; Trivedi, MH; Wisniewski, SR; Nierenberg, AA; Thase, ME; Davis, L; Biggs, MM; Shores-Wilson, K; Luther, JF; Niederehe, G; Warden, D; Rush, AJ (September 2006). "Tranylcypromine versus venlafaxine plus mirtazapine following three failed antidepressant medication trials for depression: a STAR*D report". Am J Psychiatry 163 (9): 1531–41; quiz 1666. ^ a b Thompson, C (June 2002). "Onset of action of antidepressants: results of different analyses". Human Psychopharmacology. 17 Suppl 1: S27–32. ^ a b Taylor, D; Paton, C; Shitij, K (2012). Maudsley Prescribing Guidelines in Psychiatry (11th ed.). West Sussex: Wiley-Blackwell. ^ Lavergne, F; Berlin, I; Gamma, A; Stassen, H; Angst, J (March 2005). "Onset of improvement and response to mirtazapine in depression: a multicenter naturalistic study of 4771 patients". Neuropsychiatric Disease and Treatment 1 (1): 59–68. ^ "mirtazapine (Rx) - Remeron, Remeron SolTab". Medscape. WebMD. Retrieved 24 October 2013. ^ "Australian Medicines Handbook". Australian Medicines Handbook Pty Ltd. 2013. ^ British National Formulary (BNF) (65th ed.). Pharmaceutical Press. p. 1120. ^ Möller, HJ (December 2006). "Is there evidence for negative effects of antidepressants on suicidality in depressive patients? A systematic review". European Archives of Psychiatry and Clinical Neuroscience 256 (8): 476–96. ^ a b Benazzi, F (June 1998). "Mirtazapine withdrawal symptoms". Can J Psychiatry 43 (5): 525. ^ Blier, P (2001). "Pharmacology of rapid-onset antidepressant treatment strategies". J Clin Psychiatry. 62 Suppl 15: 12–7. ^ Berigan, TR (June 2001). "Mirtazapine-Associated Withdrawal Symptoms: A Case Report". Prim Care Companion J Clin Psychiatry 3 (3): 143. ^ Klesmer, J; Sarcevic, A; Fomari, V (August 2000). "Panic attacks during discontinuation of mirtazepine". Can J Psychiatry 45 (6): 570–1. ^ MacCall, C; Callender, J (October 1999). "Mirtazapine withdrawal causing hypomania". Br J Psychiatry 175 (4): 390. ^ Ali, S; Milev, R (May 2003). "Switch to mania upon discontinuation of antidepressants in patients with mood disorders: a review of the literature". Can J Psychiatry 48 (4): 258–64. ^ White, N; Litovitz, T; Clancy, C (December 2008). "Suicidal antidepressant overdoses: a comparative analysis by antidepressant type." (PDF). Journal of Medical Toxicology 4 (4): 238–50. ^ Holzbach R, Jahn H, Pajonk FG, Mähne C (November 1998). "Suicide attempts with mirtazapine overdose without complications". Biol. Psychiatry 44 (9): 925–6. ^ Retz W, Maier S, Maris F, Rösler M (November 1998). "Non-fatal mirtazapine overdose". Int Clin Psychopharmacol 13 (6): 277–9. ^ Nikolaou, P; Dona, A; Papoutsis, I; Spiliopoulou, C; Maravelias, C. "Death Due to Mirtazapine Overdose". in "Abstracts of the XXIX International Congress of the European Association of Poison Centres and Clinical Toxicologists, May 12–15, 2009, Stockholm, Sweden". Clinical Toxicology 47 (5): 436. 2009. ^ Baselt, RC (2008). Disposition of Toxic Drugs and Chemicals in Man (8th ed.). Foster City, CA: Biomedical Publications. pp. 1045–7. ^ Buckley, NA; McManus, PR (December 2002). "Fatal toxicity of serotoninergic and other antidepressant drugs: analysis of United Kingdom mortality data". BMJ 325 (7376): 1332–3. ^ a b Fernández, J; Alonso, JM; Andrés, JI; Cid, JM; Díaz, A; Iturrino, L; Gil, P; Megens, A; Sipido, VK; Trabanco, AA (March 2005). "Discovery of new tetracyclic tetrahydrofuran derivatives as potential broad-spectrum psychotropic agents". Journal of Medicinal Chemistry 48 (6): 1709–12. ^ a b de Boer, TH; Maura, G; Raiteri, M; de Vos, CJ; Wieringa, J; Pinder, RM (April 1988). "Neurochemical and autonomic pharmacological profiles of the 6-aza-analogue of mianserin, Org 3770 and its enantiomers". Neuropharmacology 27 (4): 399–408. ^ Roth, BL; Driscol, J. Database"i"PDSD K. Psychoactive Drug Screening Program (PDSP). University of North Carolina at Chapel Hill and the United States National Institute of Mental Health. Retrieved 2013-07-27. ^ de Boer, T (1996). "The pharmacologic profile of mirtazapine". J Clin Psychiatry. 57 Suppl 4: 19–25. ^ a b c d Graves, SM; Napier, TC (2012). "SB 206553, a putative 5-HT2C inverse agonist, attenuates methamphetamine-seeking in rats". BMC Neurosci 13: 65. ^ Kooyman, AR; Zwart, R; Vanderheijden, PM; Van Hooft, JA; Vijverberg, HP (1994). "Interaction between enantiomers of mianserin and ORG3770 at 5-HT3 receptors in cultured mouse neuroblastoma cells". Neuropharmacology 33 (3–4): 501–7. ^ Wikström, HV; Mensonides-Harsema, MM; Cremers, TI; Moltzen, EK; Arnt, J (July 2002). "Synthesis and pharmacological testing of 1,2,3,4,10,14b-hexahydro-6-methoxy-2-methyldibenzo[c,f]pyrazino[1,2-a]azepin and its enantiomers in comparison with the two antidepressants mianserin and mirtazapine". Journal of Medicinal Chemistry 45 (15): 3280–5. ^ De Boer, T; Nefkens, F; Van Helvoirt, A (February 1994). "The alpha 2-adrenoceptor antagonist Org 3770 enhances serotonin transmission in vivo". Eur. J. Pharmacol. 253 (1–2): R5–6. ^ a b Berendsen, HH; Broekkamp, CL (October 1997). "Indirect in vivo 5-HT1A-agonistic effects of the new antidepressant mirtazapine". Psychopharmacology (Berl.) 133 (3): 275–82. ^ Nakayama, K; Sakurai, T; Katsu, H (April 2004). "Mirtazapine increases dopamine release in prefrontal cortex by 5-HT1A receptor activation". Brain Res. Bull. 63 (3): 237–41. ^ Blier, P; Abbott, FV (January 2001). "Putative mechanisms of action of antidepressant drugs in affective and anxiety disorders and pain" (PDF). J Psychiatry Neurosci 26 (1): 37–43. ^ Tatsumi, M; Groshan, K; Blakely, RD; Richelson, E (December 1997). "Pharmacological profile of antidepressants and related compounds at human monoamine transporters". European Journal of Pharmacology 340 (2–3): 249–58. ^ Fisar, Z; Hroudová, J; Raboch, J (2010). "Inhibition of monoamine oxidase activity by antidepressants and mood stabilizers". Neuro Endocrinology Letters 31 (5): 645–56. ^ Millan, MJ (2005). "Serotonin 5-HT2C receptors as a target for the treatment of depressive and anxious states: focus on novel therapeutic strategies". Therapie 60 (5): 441–60. ^ Dekeyne, A; Millan, MJ (April 2009). "Discriminative stimulus properties of the atypical antidepressant, mirtazapine, in rats: a pharmacological characterization". Psychopharmacology (Berl.) 203 (2): 329–41. ^ De Deurwaerdère, P; Navailles, S; Berg, KA; Clarke, WP; Spampinato, U (March 2004). "Constitutive activity of the serotonin2C receptor inhibits in vivo dopamine release in the rat striatum and nucleus accumbens". J. Neurosci. 24 (13): 3235–41. ^ Bubar, MJ; Cunningham, KA (April 2007). "Distribution of serotonin 5-HT2C receptors in the ventral tegmental area". Neuroscience 146 (1): 286–97. ^ Millan, MJ; Gobert, A; Rivet, JM; Adhumeau-Auclair, A; Cussac, D; Newman-Tancredi, A; Dekeyne, A; Nicolas, JP; Lejeune, F (March 2000). "Mirtazapine enhances frontocortical dopaminergic and corticolimbic adrenergic, but not serotonergic, transmission by blockade of α2-adrenergic and serotonin2C receptors: a comparison with citalopram". Eur. J. Neurosci. 12 (3): 1079–95. ^ Leggio, GM; Cathala, A; Neny, M; Rouge-Pont, F; Drago, F; Piazza, PV; Spampinato, U (October 2009). "In vivo evidence that constitutive activity of serotonin2C receptors in the medial prefrontal cortex participates in the control of dopamine release in the rat nucleus accumbens: differential effects of inverse agonist versus antagonist". J. Neurochem. 111 (2): 614–23. ^ Berg, KA; Harvey, JA; Spampinato, U; Clarke, WP (2008). "Physiological and therapeutic relevance of constitutive activity of 5-HT 2A and 5-HT 2C receptors for the treatment of depression". Prog. Brain Res. 172: 287–305. ^ a b Colfax, GN; Santos, GM; Das, M; Santos, DM; Matheson, T; Gasper, J; Shoptaw, S; Vittinghoff, E (November 2011). "Mirtazapine to reduce methamphetamine use: a randomized controlled trial". Arch. Gen. Psychiatry 68 (11): 1168–75. ^ Herrold, AA; Shen, F; Graham, MP; Harper, LK; Specio, SE; Tedford, CE; Napier, TC (January 2009). "Mirtazapine treatment after conditioning with methamphetamine alters subsequent expression of place preference". Drug Alcohol Depend 99 (1–3): 231–9. ^ Rose, ME; Grant, JE (2008). "Pharmacotherapy for methamphetamine dependence: a review of the pathophysiology of methamphetamine addiction and the theoretical basis and efficacy of pharmacotherapeutic interventions". Ann Clin Psychiatry 20 (3): 145–55. ^ Brackins, T; Brahm, NC; Kissack, JC (December 2011). "Treatments for methamphetamine abuse: a literature review for the clinician". J Pharm Pract 24 (6): 541–50. ^ Brensilver, M; Heinzerling, KG; Shoptaw, S (September 2013). "Pharmacotherapy of amphetamine-type stimulant dependence: An update". Drug Alcohol Rev 32 (5): 449–60. ^ Kast, RE (September 2001). "Mirtazapine may be useful in treating nausea and insomnia of cancer chemotherapy". Support Care Cancer 9 (6): 469–70. ^ Costall, B; Naylor, RJ; Tyers, MB (1990). "The psychopharmacology of 5-HT3 receptors". Pharmacology & Therapeutics 47 (2): 181. ^ a b Sennef, C; Timmer, CJ; Sitsen, JM (March 2003). "Mirtazapine in combination with amitriptyline: a drug-drug interaction study in healthy subjects". Hum Psychopharmacol 18 (2): 91–101. ^ a b Gándara Martín Jde, L; Agüera Ortiz, L; Ferre Navarrete, F; Rojo Rodés, E; Ros Montalbán, S (2002). "[Tolerability and efficacy of combined antidepressant therapy]". Actas Esp Psiquiatr (in Spanish) 30 (2): 75–84. ^ a b Ravindran, LN; Eisfeld, BS; Kennedy, SH (February 2008). "Combining mirtazapine and duloxetine in treatment-resistant depression improves outcomes and sexual function". J Clin Psychopharmacol 28 (1): 107–8. ^ Caldis, EV; Gair, RD (October 2004). "Mirtazapine for treatment of nausea induced by selective serotonin reuptake inhibitors". Can J Psychiatry 49 (10): 707. ^ Chiu, HW; Li, TC (2011). "Rapid weight gain during mirtazapine treatment". The Journal of Neuropsychiatry and Clinical Neurosciences 23 (1): E7. ^ Burrows, GD; Kremer, CM (April 1997). "Mirtazapine: clinical advantages in the treatment of depression". Journal of Clinical Psychopharmacology. 17 Suppl 1: 34S–39S. ^ a b c d Schreiber, S; Bleich, A; Pick, CG (2002). "Venlafaxine and mirtazapine: different mechanisms of antidepressant action, common opioid-mediated antinociceptive effects--a possible opioid involvement in severe depression?". J. Mol. Neurosci. 18 (1–2): 143–9. ^ Kristensen, JH; Ilett, KF; Rampono, J; Kohan, R; Hackett, LP (March 2007). "Transfer of the antidepressant mirtazapine into breast milk". British Journal of Clinical Pharmacology 63 (3): 322–7. ^ Gillman, PK (June 2006). "A review of serotonin toxicity data: implications for the mechanisms of antidepressant drug action". Biol. Psychiatry 59 (11): 1046–51. ^ Hoes, MJ; Zeijpveld, JH (March 1996). "Mirtazapine as treatment for serotonin syndrome". Pharmacopsychiatry 29 (2): 81. ^ Stahl, SM (2008). Stahl's Essential Psychopharmacology Online: Print and Online. Cambridge, UK: Cambridge University Press. ^ Abo-Zena, RA; Bobek, MB; Dweik, RA (April 2000). "Hypertensive urgency induced by an interaction of mirtazapine and clonidine". Pharmacotherapy 20 (4): 476–8. ^ Rao, DVNS; Dandala, R; Bharathi, C; Handa, VK; Sivakumaran, M; Naidub, A (2006). "Synthesis of potential related substances of mirtazapine". Arkivoc 2006 (15): 127–32. 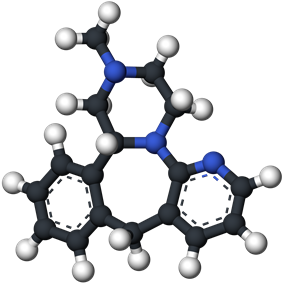 A four-step chemical synthesis of mirtazapine has been published. Mirtazapine is a racemic mixture of enantiomers. The (S)-(+)-enantiomer is known as esmirtazapine. Liver and moderate renal impairment have been reported to decrease the oral clearance of mirtazapine by about 30%; severe renal impairment decreases it by 50%. Another case report described mirtazapine as inducing hypertension in a clonidine-treated patient, likely due to occupancy of α2-autoreceptors by mirtazapine limiting the efficacy of concurrent clonidine therapy. According to information from the manufacturers, mirtazapine should not be started within two weeks of any MAOI usage; likewise, MAOIs should not be administered within two weeks of discontinuing mirtazapine. However, a single study regarding the combination reported it does not result in any incidence of serotonin-related toxicity. In addition, a case report claimed that mirtazapine can actually be used to treat serotonin syndrome. Mirtazapine in combination with an SSRI, SNRI, or TCA as an augmentation strategy is considered to be relatively safe and is often employed therapeutically, with a combination of venlafaxine and mirtazapine sometimes referred to as “California rocket fuel”. Concurrent use with inhibitors or inducers of the cytochrome (CYP) P450 isoenzymes CYP1A2, CYP2D6, and/or CYP3A4 can result in altered concentrations of mirtazapine, as these are the main enzymes responsible for its metabolism. As examples, fluoxetine and paroxetine, inhibitors of these enzymes, are known to modestly increase mirtazapine levels, while carbamazepine, an inducer, considerably decreases them. Mirtazapine is typically prescribed in doses for humans of 15, 30 and 45 mg. However, clinical doses as high as 120 mg have been reported in the medical literature. The (S)-(+)-enantiomer has a plasma half-life of 9.9±3 hours and the (R)-(–)-enantiomer has a plasma half-life of 18±2.5 hours. The overall elimination half-life is 20–40 hours. Like many other antidepressants, mirtazapine has been found to have antinociceptive properties in mice. However, unlike most other antidepressants, though similarly to venlafaxine, these effects are mostly mediated through downstream modulation of the endogenous opioid system, of which in the case of mirtazapine the μ-opioid and κ3-opioid receptors are mainly involved. Interestingly, while virtually all antidepressants differ little in their maximal effectiveness in the treatment of major depression, mirtazapine and venlafaxine have demonstrated superior efficacy in treating severe types of depression such as psychotic depression and treatment-resistant depression. This may be due to their unique influence on the opioid system, which is a property that may give them an advantage over other antidepressants in cases of severe depressive symptomatology. Mirtazapine is a very strong H1 receptor inverse agonist and, as a result, it can cause powerful sedative and hypnotic effects. After a short period of chronic treatment, however, the H1 receptor tends to desensitize and the antihistamine effects become more tolerable. Many patients may also dose at night to avoid the effects, and this appears to be an effective strategy for combating them. Blockade of the H1 receptor may improve pre-existing allergies, pruritus, nausea, and insomnia in afflicted individuals. It may also contribute to weight gain, however. In contrast to the H1 receptor, mirtazapine has very low affinity for the mACh receptors, although anticholinergic side effects like dry mouth, constipation, and mydriasis are still commonly seen in clinical practise.